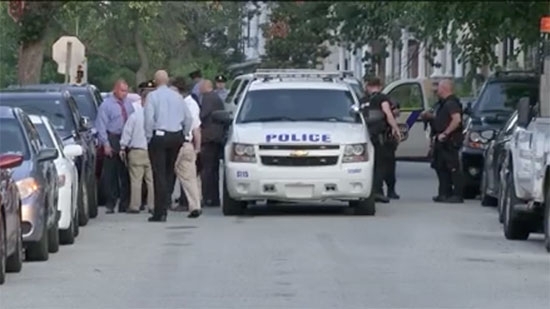 A 7-year-old girl was a victim in an apparent murder-suicide in the Manayunk neighborhood of Philadelphia on Monday morning, 8/6. It happened on the 4500 block of Wilde Street. The girl's stepfather found her in the living room of the home with a bag over her head around 11 a.m. She was pronounced dead at the scene. The girl's 45-year-old father was found dead in a second floor bedroom of an apparent suicide. The identities of those invovled have not been released. It appears the incident was the result of a "contentious custody battle." The investigation is ongoing. UPDATE: The girl has been identified as Kayden Mancuso. She would have started 2nd grade at Pennsbury School District. Her father is Jeff Mancuso. He was supposed to drop her off on Sunday night after having her for the weekend, but did not. They were found when family members went looking for her. A Philadelphia police officer was shot in the face while serving an arrest warrant in Germantown on Monday morning, 8/6. 49-year-old Jason Potts is a 20-year veteran of the SWAT team and is married with 3 kids. He is expected to be ok. It happened around 6 a.m. on the 4800 block of Knox Street. Officers were looking for a man wanted on weapons violations. SWAT members knocked and announced themselves more than once before entering the home. Officers then came under fire. Potts suffered a broken jaw and heavy bleeding. He was taken to the hospital in critical but stable condition. He is expected to survive. Officers returned fire and hit the shooter, a man in his 50's, who is now in critical condition. A woman in her 60's in the home was also stuck and is in critical but stable condition. The man who police were searching for initially was not at home and is still at large. UPDATE: The homeowner who shot a Philadelphia police officer this morning has died after being hit from return fire. The man in his 50's thought someone was breaking into his home, despite multiple announcements from the police. The man's wife was also hit by a bullet that ricocheted. Police were there to serve a warrant on their 20-year-old grandson who was not home at the time. He has surrendered to police. A badly decomposing woman's body was discovered in a basement of a home in Philadelphia's Feltonville neighborhood on Sunday night, 8/5. Neighbors had complained about the odor. The discovery was made around 8 p.m. on the 400 block of West Roosevelt Boulevard. Detectives have reason to believe the body belongs to 50-year-old Vianela Tavera from New York City, although the body could not immediately be identified. Tavera was heading to Philadelphia and was last heard from on July 28th. 38-year-old Luis E. Negron-Martinez of Philadelphia was arrested in Fairfax, Virginia on July 30th driving Tavera's car. The medical examiner will determine cause and manner of death as well as identify the remains. UPDATE: Family has confirmed that the body found belongs to Vianela Taverna. She was a mother of five from the Bronx.